Fifth wave extensions are the most difficult to count – because when you are in a 5th wave extension, you may be considering a lot of other possibilities — and when the pattern just keeps going up in a straight line for multiple days in a row – it’s difficult to count. But then when you step back and look at it holistically, it makes much more sense. So whenever you begin with an A-B-1-2 and then it goes straight up from there — reference this diagram so you know how long a 5th wave extension could last. Also, it happens to keep in mind the time frame. For example, a Santa Rally – just a few days before Christmas — could experience a prolonged upward movement — even beyond supposed resistance zones. The market will just blast right through those–until the last 15 minutes of Christmas eve — when it finally finalizes the fifth wave extension and the Santa Rally is over. Only then, can you begin to short. 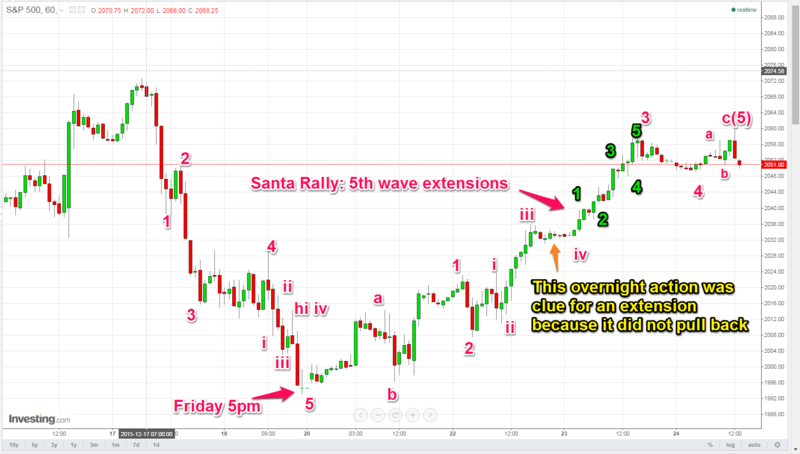 The Santa Rally extended 5th wave above didn’t stop at 2060 — it did pull back towards 2045, but then extended yet another 5th wave up towards 2075 — completing this C-wave of an A-B-C wave 2. The top of this C-wave exceeding the top of the prior A-wave high. 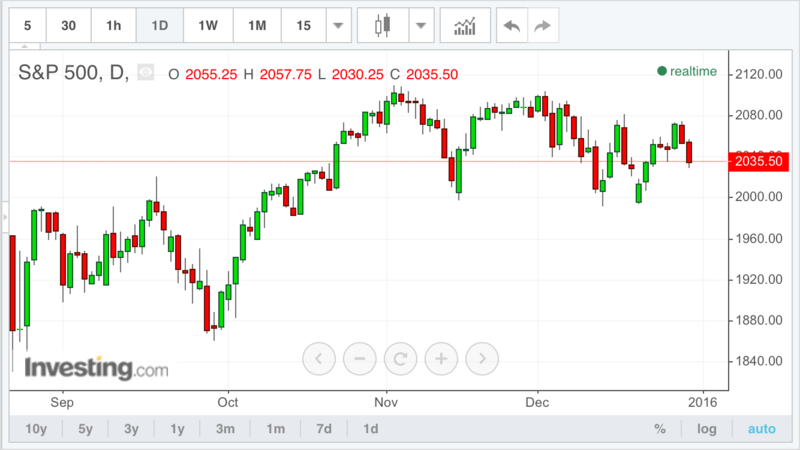 This chart looks like the top towards 2075 was lower than the preceding high of what looks like 2080 — but actually the front-month ES futures contract had a changeover from December futures contract to March futures contract. So this chart isn’t the best representation. But if you look at a chart from Finviz of S&P futures, you will see that the top of C in this A-B-C wave 2 structure exceeded the top of A. 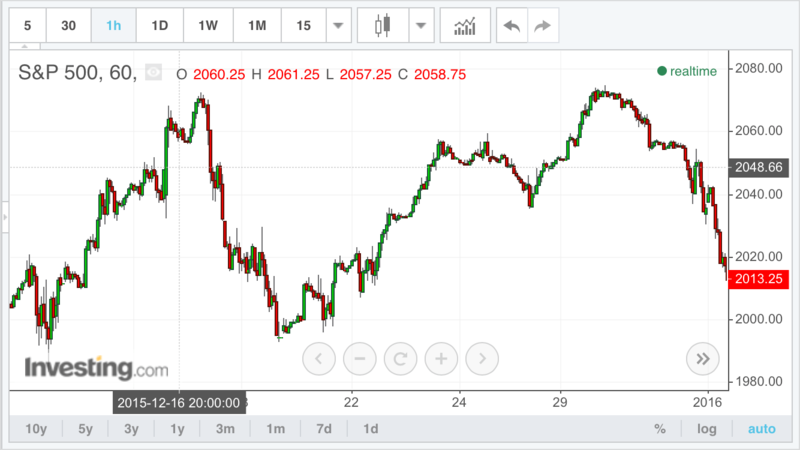 Here is a FinViz chart of the S&P futures on daily chart — notice the wave 2 top had a C-wave high that was higher than the initial A-wave high near the 2075 level. The c-wave high was an extended 5th wave pattern as shown above. Eventually we went towards 2118 and then turned down towards 2055. 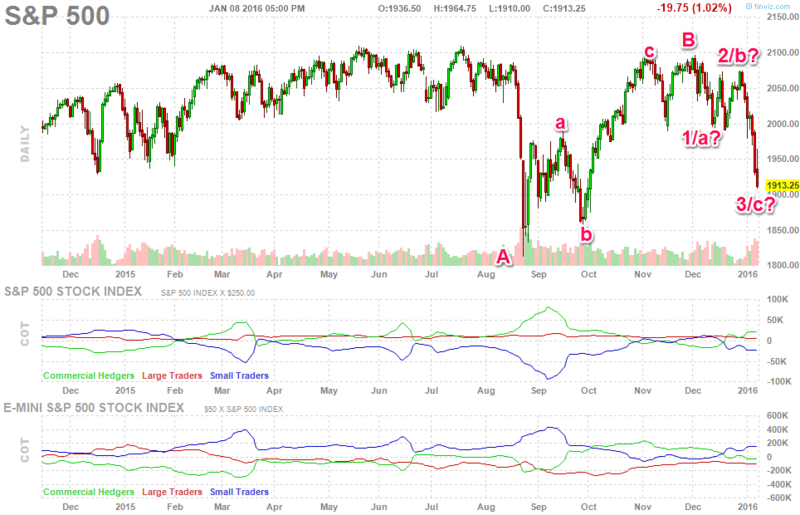 That 2118 may have been a b-wave top. There was a futures rollover around June 12 – so the numbers are off a bit. But here’s the correction that followed – breaking those support levels that held during this 3rd wave extension up. So while extensions can extend beyond traditional pattern expectations, those 4th wave support levels are not invincible. When 5waves complete to the top –or we get a b-wave fakeout top (as we did above) – then that opens the door for the 4th wave support levels to be broken after a 3rd wave extension.